If you do not list colors you will get an assortment of OUR choice. Elastic is 1/8 inch. You can choose any colors, in any quantity, however, we reserve the right to limit your choice to 5 yards of a color. Minimum per color is 1 yard, no half yards are sold. See below for a link to our 12 yard rolls. 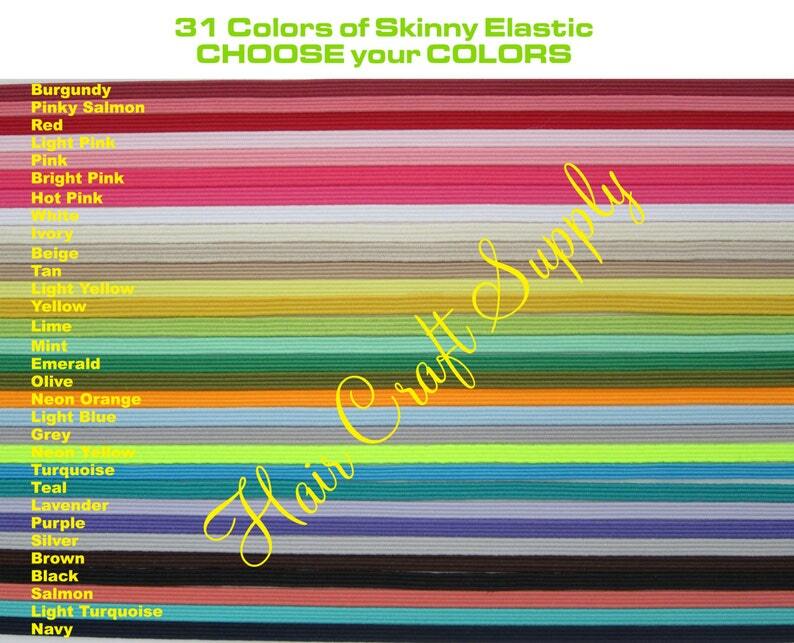 1 yard = 36" - this is skinny elastic for headbands. Each yard will make at least 2 headbands. PRICES: - Choose accordingly from drop down menu. 50 yard rolls are available in other individual listings. 50 yards of the same color for $12.00. message me for larger quantities to make sure we have it in stock. Headbands shown are for informational use only to show this product in use. Great colors, perfect for what I wanted! Thank you!